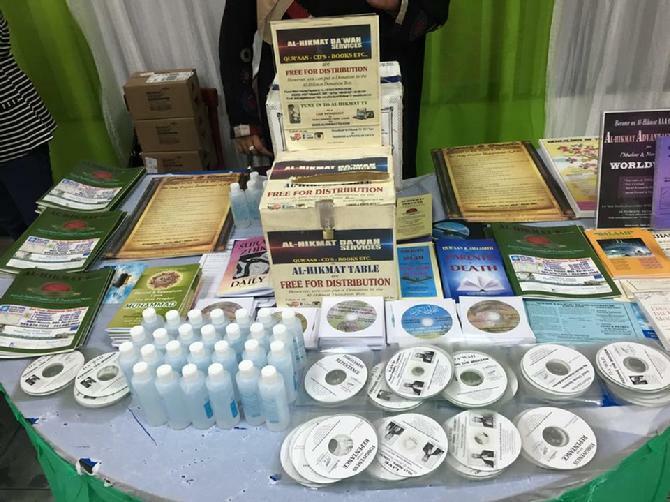 Al-Hamdulillaah, since September 11th 2001, Al-Hikmat has distributed thousands of Qur’aan and Islamic literature to Non-Muslims, New Muslims and Correctional Institutions throughout the USA. There is never enough Qur’aan available for the countless request on a daily basis. We therefore kindly request you to contribute $3.00 towards the distribution of one Qur’aan for Non-Muslims, New Muslims and Correctional Institutions in North America and the Caribbean, Inshaa Allaah. You can also dedicate/sponsor these Qur’aan as Sadqa Jaariya for deceased parents or loved ones. As Muslims, it is expected from us to give the message of the Holy Qur’aan to Muslims and Non-Muslims. Therefore, it is even more obligated upon us to spend whatever we could afford to provide Qur’aan and Da’wah materials, in response to the numerous request by Non-Muslims and New Muslims, otherwise we could be questioned by Allaah on the day of Judgment for failing to spread the message of the Holy Qur’aan.